The Atlantic charitometrid Crinometra brevipinna. Photo by John E. Miller. In earlier posts on this site, I've presented snippets of the diversity of fossil crinoids, so perhaps it was about time I finally worked up to the modern taxa. Today's Taxon of the Week is a family of feather stars, the Charitometridae. Despite including the vast majority of modern species (and the best-studied of modern species), the feather stars (the order Comatulida) are in fact somewhat odd creatures within the main scope of crinoid historical diversity. The main point of oddness, of course, is their massively reduced stem (other strange features, which they share with other living crinoids, include the reduction of plating on the adoral side of the animal). When they first settle down from their free-swimming larval stage, feather stars are attached to the substrate by a stalk as in more typical crinoids, but before they reach maturity they once again break free. Technically, however, adult feather stars are not completely stemless - the proximalmost part of the stem is retained, and this becomes expanded and fused with the infrabasals (the lowermost ring of plates in the main body of the crinoid) to form the large basal plate known as the centrodorsal (Breimer, 1978a - it may seem odd to have something called the "centrodorsal" on the underside of the animal, but the thing is that, compared to other living echinoderms, crinoids are upside-down). The centrodorsal is the point of attachment for the cirri, tendril-like outgrowths of the underside. The cirri are used by the feather star for moving about, like something out of a Japanese cartoon. Chondrometra robusta, a charitometrid from around the Philippines and Indonesia, with distinctly large cirri compared to other members of the family. Figure from Clark (1950). The majority of studies on modern comatulids seem to relate to two families, the Antedonidae and Comasteridae - particularly the former. The Charitometridae, in contrast, have been much more neglected. As far as I can tell, they seem to have been pretty much untouched since being monographed in 1950 by Austin Clark, who recognised 32 species divided between eight genera, distributed pretty much world-wide but with the main centre of diversity in the Pacific (only a single genus, Crinometra, seems to have made it into the Atlantic*). Clark distinguished the Charitometridae from related families by the presence of distinct covering plates at the bases of the pinnules (the side-branches of the arms), by the lack of differentiation between pinnules at the bases and more distally on the arms, and by the relatively undifferentiated cirri. In general, Clark regarded the Charitometridae as a more generalised form than the closely related Thalassometridae, though of course in those pre-cladistic days its a little difficult to know exactly what he meant by this - whether or not he was actually saying that the charitometrids were ancestral to the thalassometrids, or whether he was just making a comparison. *Clark recognised only a single species in this genus, Crinometra brevipinna, but a large number of varieties within that genus. Whether some of those varieties might be recognised as species were the genus to be revised, I couldn't say. This lack of specialisation is perhaps part of the reason for the lack of study of charitometrids - Clark (1950) writes at length about the difficulties of distinguishing taxa within the family, and one gets the distinct impression that he was not particularly satisfied even with the system he himself ended up using. Even more of a factor, probably, is that charitometrids seem to be mostly inhabitants of deeper waters - Clark gives a depth range of 55 - 2194 metres. The ecology of the group, not surprisingly, seems to be completely untouched - we know that they're down there, but we don't really know what they're doing with their time. Breimer, A. 1978a. General morphology: recent crinoids. In Treatise on Invertebrate Paleontology pt. T. Echinodermata 2. Crinoidea (R. C. Moore & C. Teichert, eds.) vol. 1 pp. T9-T58. The Geological Society of America, Inc.: Boulder (Colorado), and The University of Kansas: Lawrence (Kansas). Breimer, A. 1978b. Ecology of recent crinoids. In Treatise on Invertebrate Paleontology pt. T. Echinodermata 2. Crinoidea (R. C. Moore & C. Teichert, eds.) vol. 1 pp. T316-T330. The Geological Society of America, Inc.: Boulder (Colorado), and The University of Kansas: Lawrence (Kansas). Clark, A. H. 1950. 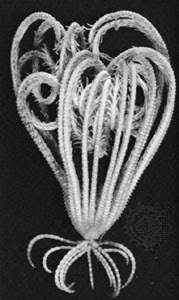 A monograph of the existing crinoids. Volume 1. The comatulids. Part 4c.-Superfamily Tropiometrida (the families Thalassometridae and Charitometridae). Bulletin of the United States National Museum 82 (4c): 1-383. Do they...have organs? Seems like they're all arm, no body. The bulk of the organs, particularly the digestive system, are concentrated in the calyx, the little cup at the base of the arms (here's a diagram). Some of the internal organs extend into the arms - the gonads open onto specialised pinnules, for instance. But on the whole, crinoids don't have particularly flashy anatomy. After all, they're filter feeders - they just don't need bells and whistles. "They have no brain. They have no place to put one." That's good, I like that. I'm guessing from the quotation marks that it's a quote from somewhere - where did it come from?